I take pleasure in seeing the fruits of an enterprising young man as much as the next person, but over the past few months I’ve been witness to quite the sweet deal for one particular math tutor. A little background first. I often find myself at a particularly large Starbucks coffeehouse in Santa Monica. This one is nice because there are a lot of tables for people like me who need a place to do some serious blogging. For quite some time now, I’ve observed a flourishing business operation taking place at one of the large tables. The business is mathematics tutoring and the proprietor is doing quite well for himself in these uncertain economic times. His modus operandi is as follows. He uses Starbucks as his office nearly every day of the week. His tutees are generally young, attractive, self-absorbed high school girls who strut in with their Louis Vuitton purses, freshly done nails, and Blackberry cell phones. Typically, the girl sits down, opens her notebook, he scribbles down a math problem, and then leaves the premises or starts texting someone. The last time I saw him, he left for 15 minutes to walk down the street to grab a burger and proceeded to eat it in front of the distracted student. For most of the time he was gone, the student was busy texting or staring into space, definitely not focusing on her math problems. 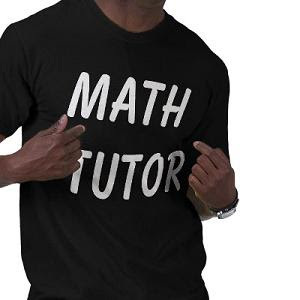 The tutor generally conducts half hour or one hour sessions. I estimate that he spends 10-20% of the time tutoring, and the rest walking around, eating, or texting. It’s a nice gig if you can get it! The indolent tutor exhibits the fruits of a low-stress worker. He is a large, hulking young man having the stature of a line backer. His business apparel consists of cargo shorts, a t-shirt, and flip-flops. I’d estimate he is of college age, although I don’t see any evidence of him being in school. With all this background information, let’s tie it all together. This entrepreneur has found the perfect situation. With a little ability in math (I’m giving him the benefit of the doubt), he can surround himself with pretty young girls who pay him an hourly fee for doing very little actual work. Presumably, the parents of the girls pay him directly because I never see money change hands. The girls are happy because they are likely carrying out their parent’s wishes to get help with math. The parents are happy because they think they’re helping their child in school, albeit in an indirect way. And of course our friendly tutor is happy as a clam. If I’ve motivated anyone to start up a new tutoring business in this mold, I expect a 10% consulting fee! Love this story. What a scam. I got best help in my study thank you. Hello,I am student at Tutor Pace ,I take online tutoring from here.Its amazing sites. And I love your blog, I will defiantly share this to my math tutor.